Scanning the list makes your choices pretty obvious, WAV and MP3 are the only formats universally supported. WAV is better for short sounds such as sound effects. MP3 files are compressed, making them ideal for longer audio files like dialog or background music, but more processor intensive, since they need to be decompressed to be played. THAT ALL SAID, WAV CURRENTLY DOESN’T WORK IN THE SIMULATOR, AT LEAST ON WINDOWS!!! Stick to OGG and MP3 for all sound files for now! You can specify how the audio files should be played, either using WebAudio or DOM. 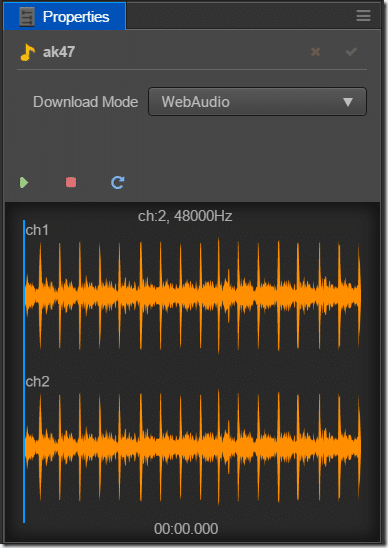 Selecting Web Audio has good compatibility across devices/browsers but consumes more memory. DOM audio uses less memory but can have limitations, such as only being able to play one instance of a sound at a time. 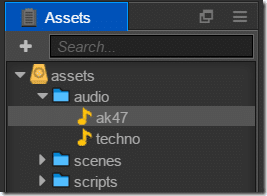 Now that we have sound files, lets use them. Attach a component to an object in your game. 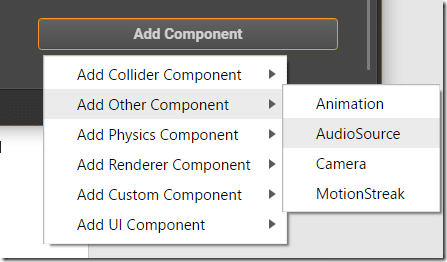 Select Add Other Component->AudioSource. If you want the sound effect to loop, play automatically when loaded, be muted, etc… check the corresponding box. Now let’s look at the way we play this component using a script. 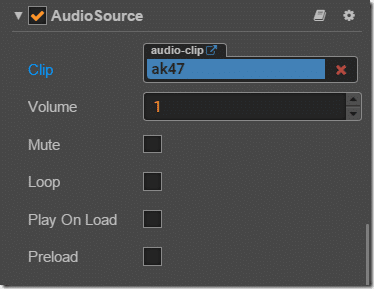 I simply connect a new script to our object containing the AudioSource component. Notice in the check for the SHIFT key being pressed we implement a callback using setFinishCallback(). This function is used to reset the lastAudioID to -1.